The latest musical drama Sparkle is actually a remake of the 1976 film starring Irene Cara as the title role of Sparkle. Except this time, Jordin Sparks, American Idol winner is stepping into the role of the titular character in her major motion picture debut. Unfortunately, as you well know, this would also be the last motion picture that Whitney Houston would be some featured in. This very remake was a passion project that Houston was involved with for 10 years. But does Sparkle have the shine to make it, even in the light of day? The movie follows 3 sisters in the late 1960’s; a naïve young church girl named Sparkle (Jordin Sparks), a determined medical student named Dee (Tika Sumpter) and a singer determined to leave her situation named Sister (Carmen Ejogo). All the while, these sisters are living under the roof of Emma (Whitney Houston), their mother who was a former star & tries to raise her girls in church. After Sister’s performance makes a strong impression at a local club, an aspiring manager named Stix (Derek Luke) goes church hopping to find the girls and eventually offers Sparkle an opportunity to live out her dream to sing with the condition being that she is able to bring her sisters along with her. As the girl group begins to gain momentum, the price of fame eventually comes at the cost of the families own self destruction. Sparkle has outfitted with a great cast. The strongest performances came from Carmen Ejogo’s complete transformation into Sister & Mike Epps, who breaks from his trademark comedy role & ventures into a dark role in an abusive spouse. Whitney Houston delivers an impassioned performance as Emma. There were a couple of instances where it seemed like she overacted. However, Whitney seemed to have chemistry with every character (onscreen partner), delivering some really powerful scenes. Aside from her stellar musical chops, Jordin Sparks played the role well as she shows that she has potential dealing with emotional drama. Sparkle had a very stylized look to it. Being that it was a period piece, the set design & costumes were able to show off the spirit of the late 1960’s into early 1970’s, which was further complimented by the accompanying soundtrack. 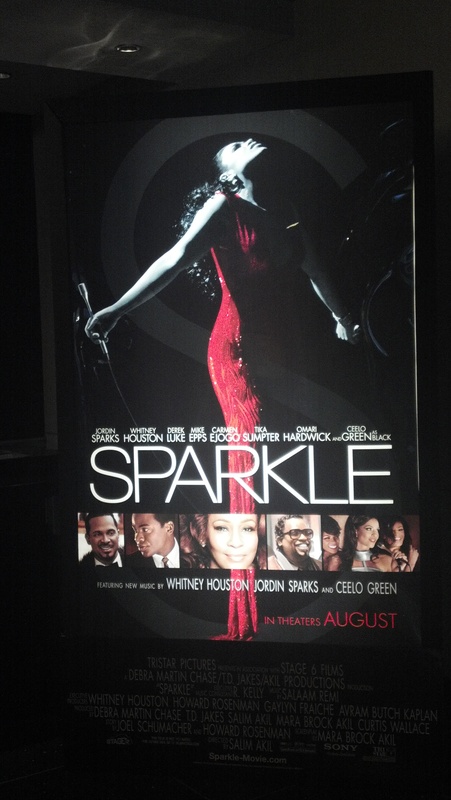 The cinematography for Sparkle was very well composed. Despite the best effort of the cast, the story wasn’t too impressive. It just seemed like a lot like the action was seen before in previous ‘follow your dreams’ movie. Just when the movie starts to gain ground, it gets a sudden case of M.I.S. There were times where it felt like Save the Last Dance. There were times where it felt like a music video. And there was a point I was trying to figure out what the heck I was watching. Not so much from the moment itself but just the confusion of how the matter was treated. It was honestly was the closest I ever came to walking out of a movie but I had a moment where I felt like Judge Marshall Stevens in the comedy Liar Liar, where it was ‘only out of sheer morbid curiosity’ that I dared to finish the movie. I was satisfied with the ending, though the story seemed to have lost steam as it again relied solely on follow your dream isms. Thankfully, the performances were entertaining. A certain performance by Houston as well as one by Sparks performing an original song written & produced by R. Kelly really captures the spirit Sparkle strives to bring.